When an employer hires someone to work for them, they are asking that person to be a representative of the company. The best outcome is to have hired an employee who is respectful, productive and trustworthy. The worst would be for the employer to face negligent hiring claims in court against a customer or another employee who was hurt in some way by the employee. Negligent hiring claims could be costly, not only in dollars, but to the company's brand and reputation. Is your business running pre-employment background checks to protect against negligent hiring claims? According to the history of pre-employment background screening, negligent hiring claims were first considered in the early 1900's. An employer witnessed reckless behavior that caused the death of an employee but kept the wrongdoer employed after the fact. The law was then expanded to include other harmful acts that caused damage outside of the company's physical work space and violence against customers. From this point, employers recognized that anyone who worked for their business also represented their business and therefore should be screened accordingly. In each of these cases, the employer could have been protected with further due diligence before hiring the offending employees. An employer who performs pre-employment background checks would have uncovered these crimes and prevented the employees from being hired negligently. Employers may feel they're in a pinch when it comes to preventing bad hires. For one, background checks may slow down the hiring process or be too costly. The good news is that a slow hiring process can be prevented with a closer look at the actual cause and suggestions on making hiring and screening more efficient. Also, background checks don't have to cost a fortune - especially if they're saving you one. Consider the amount of punitive damages you could be paying if your employee commits a crime like those mentioned above. After assessing the criminal record, you may find the candidate isn't a good fit or you'll find the criminal history had nothing to do with their ability to perform their job responsibilities. Another consideration for employers to avoid negligent hiring claims is to screen existing employees on a regular basis. 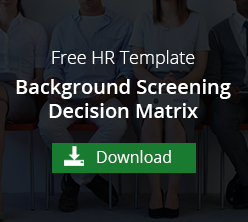 At the time of hire, the employee may have had a clean or acceptable background check. With time, however, the employee's life may have changed causing other potential harmful traits that would not be acceptable. Include information about regular background checks in your hiring documents. Obtain consent and authorization always before screening any applicants and employees. Negligent hiring claims can be costly to a business, in reputation and in dollars. Protect your business and hire the right company representatives by running pre-employment background checks.